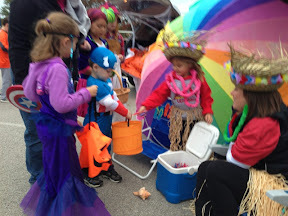 Yesterday was the fall festival at Alyce's school. It was a fund raising event and by the looks of it pretty successful. It was also the first time the kids got to wear their Halloween costumes. 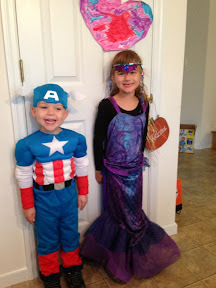 This year Luke is Captain America and Alyce is a purple mermaid. At the event there was a Trunk or Treat. People decorated their vans and the kids hit everyone for candy like they were houses. It was neat and fast.